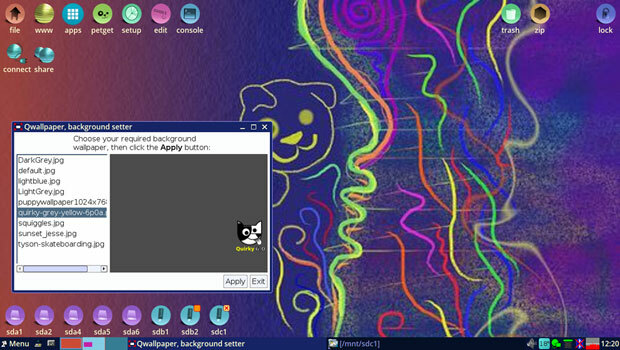 Quirky Xerus64 is a far stretch from the look and feel of Windows 10. Its Welcome screen simplifies desktop setup. Quirky is related to the Puppy Linux family of distros, but it is not a mainline Puppy Linux release. Rather, it is a distinct distro in its own right. Its website is minimalist, but you can search out technical support for Quirky in the Puppy Linux forums. Version 8.6 is an incremental release with package upgrades and architectural improvements, including the Linux kernel 4.14.63. One of its newest tricks is providing support for file sharing with an Android phone via the EasyShare network file and printer sharing tool. I am a long-time Puppy Linux fan. I’ve relied on it for years as a pocket Linux tool. Quirky goes several steps further with innovations for enhanced productivity. 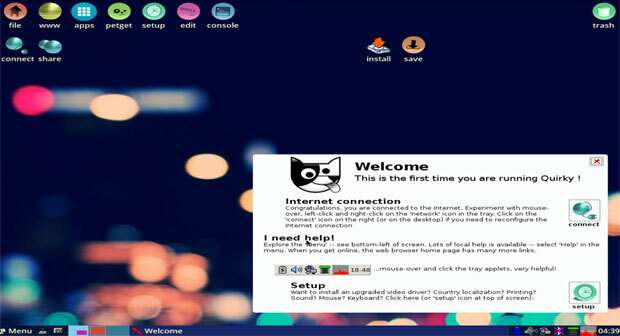 The main menu in Quirky Linux is stuffed with many of the tools and applications found in its cousin distro, Puppy Linux. Kauler forked Puppy Linux into Quirky Linux back in 2009 in order to explore new concepts. He had stepped down as Puppy Linux’s lead developer a few years earlier, only to return with a new dogpound of ideas in the Quirky distro offshoot. Quirky is binary-compatible with x86_64 Ubuntu 16.04.5 LTS. Otherwise, it is nothing at all like Ubuntu. It is architecturally very different. Quirky is an experimental distribution that boots from a USB stick or CD and runs in system RAM for lightning-fast performance. Like its Puppy cousin, Quirky is a lightweight distro that provides a powerhouse of features and usability. It looks like a Puppy Linux clone, but Quirky Linux follows a different path than its Puppy distro cousin. Quirky Xerus explores some new ideas while continuing the Puppy Linux tradition of providing a full suite of optimized applications, drivers and utilities in a very small size. Quirky Linux’s desktop structure and appearance are similar to Puppy Linux. Under the hood, Quirky is much different than Puppy, but its applications, utilities and user interface indicate a strong connection to Puppy. Quirky uses Joe’s Window Manager for its desktop environment. JWM is a more compact desktop interface than found in GNOME or Xfce or LXDE. Both distros are designed to run on legacy, low-powered desktops and laptops. However, Kauler did not stop at lightweight. He shoehorned lots of heavyweight performance into Quirky. For instance, he succeeded in weeding out typical lightweight applications in favor of full-featured heavyweights like GIMP and LibreOffice. Puppy Linux is not meant to be fully installed on a hard drive. It lets you do a partial or frugal hard drive installation. That is where the persistent storage comes from by using a special personal savings file on the hard disk or a 2-GB USB stick. Quirky Linux is sort of structured to function in reverse. It is designed to be fully installed. However, it does not have to be. You can run it from a CD or USB drive and maintain configuration updates for a pocket Linux system with a setup option. If you are really adventurous and your hardware supports an SD card, you also can run Quirky from that storage device. Quirky Linux is aptly named. It is peculiar compared to whatever operating system you use. Still, it has traditional panel bars, familiar-looking menus, and lots of configuration options. 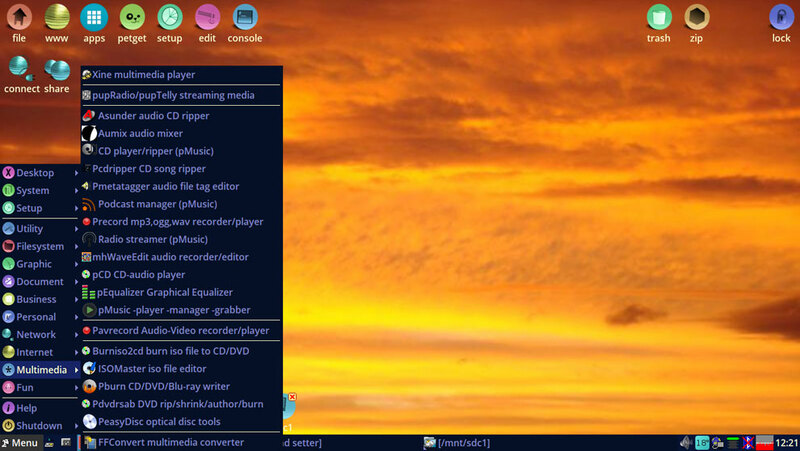 Quirky Linux is configured from a main control panel and many menu tools. You can access the menu from the button on the left of the panel bar or by right-clicking on the desktop. I have a long satisfying history with Puppy Linux. I started using it a decade ago on a USB drive when I traveled around frequently and was working on banks of Windows boxes in whatever office I visited. So Quirky Linux fits right into my computing routines. It offers the next generation of portable Linux power and productivity. It takes the Puppy Linux concept to the next level. That familiarity makes working with Quirky a comfy experience. 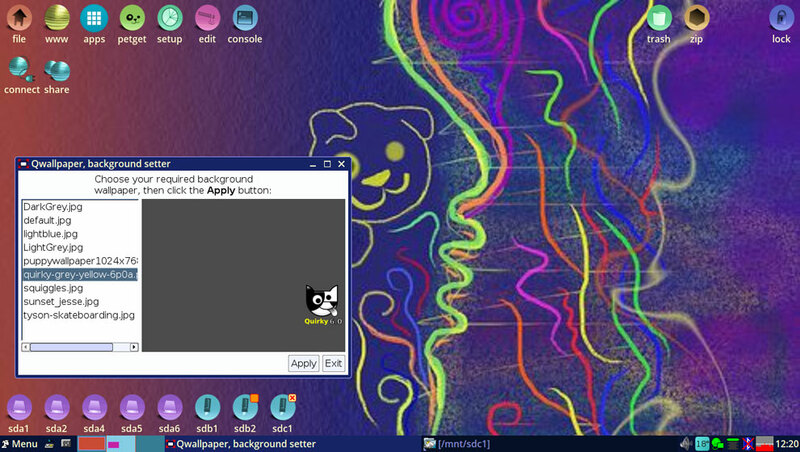 Quirky is not a dumbed-down Linux distro crammed onto a USB drive. It comes complete with a full set of kernel, printing, scanning and camera drivers. It has an ample supply of multimedia libraries. The Adobe Flash player is included as an optional installation. Quirky offers a quick install option of some common programs. Quirky also does not skimp on applications. It includes a full suite of top-rated programs. The current release sheds some of the earlier software baggage such as Ami Word and Gnumeric spreadsheet. Instead, you get the LibreOffice 5 office suite and lots more business and multimedia software headliners. The default Web browser is SeaMonkey version 2.49.4, but other choices are available in the PETget Package Manager. Also included are Leafpad text editor and Geany IDE/editor. Other standard apps are ROX-filer file manager, the MPlayer media player and CUPS (Common Unix Printing System) support for printing. Overall, the software available through the Quirky repository will handle most, if not all, of the typical user’s needs. If you are familiar with Puppy Linux, you will be right at home running Quirky Linux. If you know any of the Ubuntu Linux desktop flavors, you will need some time moving in and getting cozy with Quirky. The menu is nearly overwhelming. The categories are stuffed with applications that appear foreign. You will recognize some classic software titles. Mostly, though, you will have to click around to see what the Puppy/Quirky titles do. Like Puppy Linux variants, Quirky’s software format is the Pet file structure. The Pet repository has its unique characteristics. It gives you access to numerous Ubuntu software warehouses, but those applications are packaged in the Pet format. As is typical for lightweight desktops, the JWN environment is bereft of glitz, glitter and animations. But the speed and the range of functionality will impress you. Quirky Linux has only a few background images. Its Qwallpaper switcher app lacks a random or timed display function. I last reviewed Quirky Linux in January of 2014. I was pleased with its performance then, but it didn’t displace my well-worn earlier version of Puppy Linux installed on a USB drive. Quirky Linux succeeded this time around in replacing that well-worn Puppy distro. After testing this latest release, it was an easy decision to keep using it rather than process an upgraded installation of a more recent Puppy Linux release. Being familiar with how Quirky operates, I was more concerned with newly developed differences Quirky Xerus 8.6 displayed in setting up and running its various options for full and partial operation. One of its chief advantages is using it as a live session OS with the ability to maintain persistent memory easily. Installing an OS to a USB stick is a potential dogfight. The variables involve both the application that burns the system to the USB drive and the quality of the USB drive itself. The drive’s transfer speed is a factor in how well Quirky on a Stick performs. As I expected, Quirky booted up from CD without any issues. However, running the OS from CD (or DVD) involves a long waiting period for the code to transfer to system RAM. You can continue to run Quirky from the CD if you are satisfied with the default settings and software. Or you can click the SAVE button on the desktop to store your configuration settings and software updates in a special file anywhere you wish on the hard drive. This approach gives you a computing solution that amounts to a live session on steroids. This method is a great way to run a first-class Linux OS on your Windows computer in a dual-boot setting without the hard drive partitioning issues. From the live session startup, you can click the INSTALL button on the desktop to do a full installation of Quirky Linux to a hard drive. Do you have an external USB hard drive hanging around? Use that and take the full installation to any computer, but plug it into the external drive. Be prepared for some troubleshooting if you opt for the USB stick installation method. You might have to try several different USB devices. It seems that the installation process for Quirky Linux can be a bit quirky. instructions for installing Quirky Linux to a USB stick as well as other storage options. One of the tools for installing Quirky to a USB stick is the dd utility — but that did not work well. Neither did a few other tools. What did work was doing the installation from the running live session using the Setup option in the main menu. I clicked on the Easy DD Frontend for dd tool and had Quirky installed on an 8-GB (recommended minimum size) USB thumb drive. It is much easier — and apparently more effective with Quirky Linux — than using the dd commands in a console window. The application asked me to click on the location to the image file and then click on the location of the USB drive getting the installation. It is a long process — it took 30 minutes — but it worked. Get Quirky Linux here. You have two choices. One is the standard ISO to burn to CD. The other is the gz archived package used for installing Quirky Linux to a USB drive. Quirky Linux is not a distro that meets everyone’s computing needs. Unlike other distros, such as Linux Mint or Zorin, Quirky Linux does not have the look and feel of a Windows desktop. Debian has evolved to become one of the most popular distributions. It’s stable branch dominates the Linux powered web hosting services. The popularity of Debian also lead to the entire generation of Debian-based distributions, including Ubuntu and Knoppix. Debian has three releases: stable, testing, and unstable. Stable is meant to be used on servers and by users who don’t want their systems to change frequently. Stable has packages that are very well tested and as a result they could be old. Testing has packages that are not part of stable yet but are in the queue. Most Debian-based distributions, such as Ubuntu, are based on testing. It’s also suitable for desktop on home PCs. The current version of Debian is 9 and its code name is Stretch. Each version of Debian is code-named after a character from the movie Toy Story. The unstable branch is code-named Sid, because Sid is the character that breaks everything. The Zore OS project has announced the release of Zorin OS 12.4. It’s based on Ubuntu 16.04 LTS. Zorin OS is known for being one of the most polished Linux based distributions that’s targeted at those who plan to move away from Windows or macOS. In a previous interview, the Zorin OS founder, Artyom Zorin, told me that the goal of the project is to make it extremely easy for a user to use Linux. Users should not have to choose between convenience and Linux. Zorin OS 12.4 comes with the newly-included Linux kernel 4.15, as well as an updated X server graphics stack, add compatibility for newer computers and hardware in Zorin OS. Zorin OS comes in four versions – Core, Lite, Ultimate, and Business. While Core is available for free, other versions are available for a fee and come with extra packages, settings and official support. GraphPipe to enhance machine learning applications. GraphPipe is an attempt to standardize on the client end and transport layers of machine learning. Most ML deployments have to build a custom solution that may not deal with multiple ML backends very well, according to Jack E. Gold, principal analyst at J.Gold Associates. If the open source community sees Oracle’s actions as an attempt to gain an advantage for the company, then they will not be very interested in working with it, he warned. Oracle no doubt will gain some benefits from open-sourcing GraphPipe. It already has some capability in this space. Other vendors, like Google and Microsoft, have been trying to build out similar capabilities, noted Gold, but those attempts so far have not been via open source. Developers have made progress over the last few years in building machine learning into applications, Abrams pointed out, but successfully deploying a model requires overcoming several problems. There is no standard for model serving APIs, which means users are limited to whatever framework is at hand, he explained. Also, building a model server can be very complicated. Further, many of the existing solutions lack a focus on performance in some use cases. Abrams and his team developed GraphPipe to address those challenges. Who gains more from the cooperation is the tricky part, McGraw said. If the library is useful, it will be picked up by developers, who by now use open source things in almost everything they build. GraphPipe is a network protocol that simplifies and standardizes transmission of machine learning data between remote processes. No dominant standard exists for how tensor-like data should be transmitted between components in a deep learning architecture. Developers commonly use protocols like JSON. But that solution is inefficient. TensorFlow uses multiple protocol buffers, which makes it a large and complex software. GraphPipe’s design solves both of those limitations by bringing efficiency through a binary, memory-mapped format while remaining simple and light on dependencies. It includes simple implementations of clients and servers that make deploying and querying machine learning models from any framework less complicated. 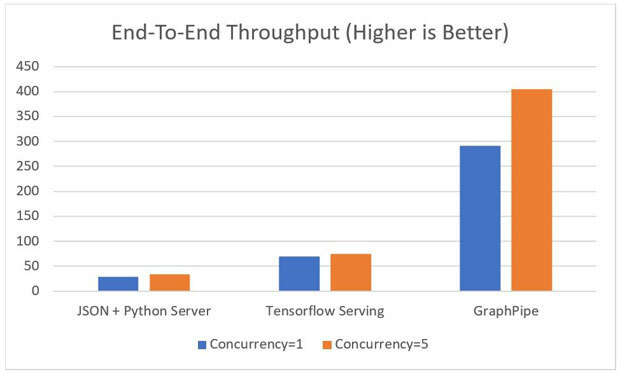 GraphPipe’s servers can deliver models built in TensorFlow, PyTorch, mxnet, CNTK, or caffe2, according to Abrams. GraphPipe is available on Oracle’s GitHub, along with documentation, examples and other relevant content. GraphPipe comes with guidelines for serving models consistently according to the flatbuffer definitions. The package contents also include examples for serving models from TensorFlow, ONNX, and caffe2 along with client libraries for querying models served via GraphPipe. GraphPipe behaves much like a TensorFlow-serving predict request. It uses flatbuffers as the message format, according to Oracle. Flatbuffers are similar to Google protocol buffers. But it provides the added benefit of avoiding a memory copy during the deserialization step. The flatbuffer definitions provide a request message that includes input tensors, input names and output names. GraphPipe relies on a remote model to accept the request message. It returns one tensor per requested output name. The remote model also must provide metadata about the types and shapes of the inputs and outputs that it supports. 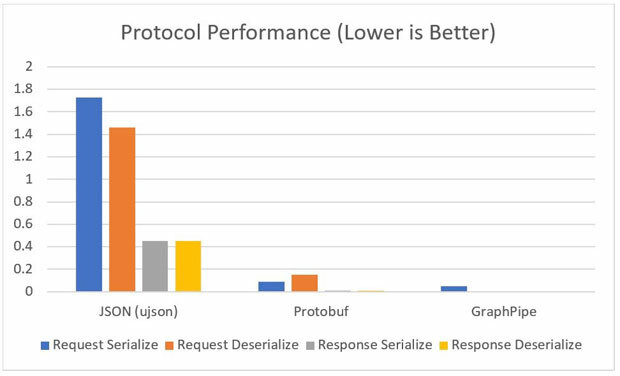 Protocol performance is better in GraphPipe, based on a comparison of serialization and deserialization speed and end-to-end throughput. This creates an interconnected web that props up all projects involved, not just GraphPipe. “Choosing established standards eases implementations, as there is nothing new to learn, understand or vet out,” Goldberg told LinuxInsider. Shifting their stance on support for open source has been hugely important for companies like Microsoft and Oracle, observed Goldberg, and there will be many benefits from the success and continuing maturity of projects such as GraphPipe. With their established brands and resources behind such projects, large enterprises will be more inclined to adopt these tools and products. Oracle has been on a path to becoming a huge champion of collaboration and transparency, he suggested. The company has focused on finding the best holistic solutions for customers, and that is an indication that its embrace of open source is authentic.